Im forward planning and was wondering if putting in place a CAT6 ethernet cable would be okay to act as the data extention cable to connect the BT Infinty modem to the router? It would be fine, over kill as you only need one twisted pair, CW1308 stuff would suit better and fit RJ11 style connectors a lot better. Cool, thanks for the confirmation. I was thinking about neatening things up a bit and terminating the ethernet cable to a ethernet socket (like this one). Would that be okay aswell? Or does it need a straight run to the router? So it is, my bad, that is not really the data extension cable then. 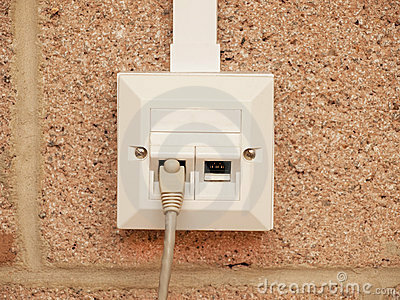 Use of phrase data extension cable threw me, that usually refers to faceplate socket to modem. The lead between modem and router is just a standard CAT5e cable, and thus CAT6 is fine, well over spec but fine. For routing around a house CAT5e is more flexible. 100m of cat5e between modem and router should have no impact on performance. Yes, and RJ45 socket in a face plate at each end is the best way. terminating Cat5e or Cat6 infrastructure cabling in RJ45 plugs can be problematic, so use the sockets with a patch lead at either end. The length limit of 100m for ethernet comes only when on solid core cable. The length is stated to be 30m when using flexible patch cable. I don't know of any practical tests that have tried to go further. THe other important desctinction is how to terminate solid core and multi core. ONLY Multi core should be used with RJXX plugs. BT / Openreach - You've finally done well. Very well indeed. Those two rules do generally apply, but you can get solid core RJ45 connectors e.g.